On this particular Sunday in early June 2015 I allowed myself to be sidetracked on the way to Mt Gordon and Mt Strickland at Dom Dom Saddle. Driving through the Black Spur and arriving at the Saddle, just seeing the sign was too much of a temptation. I pulled over and did a quick search on the tablet for access to Mt Dom Dom. It looked straightforward so in I went. At the end of the Dom Dom Saddle picnic ground car park there are two tracks. 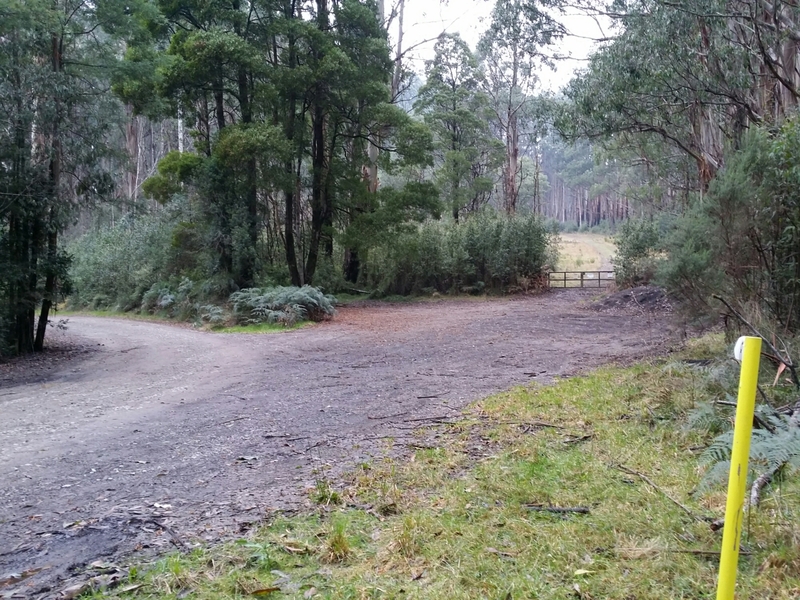 The one on the right is gated and leads to walking tracks to Mt Boobyalla and Mt Donna Buang. The one on the left is Dom Dom Rd. I took this dirt road in good condition for 1.4km, where it forks and continues left up the mountain. As the fork marked a transition from dirt road to logging track, I parked and set out on foot. I followed the track, keeping left after a few hundred meters to the top. 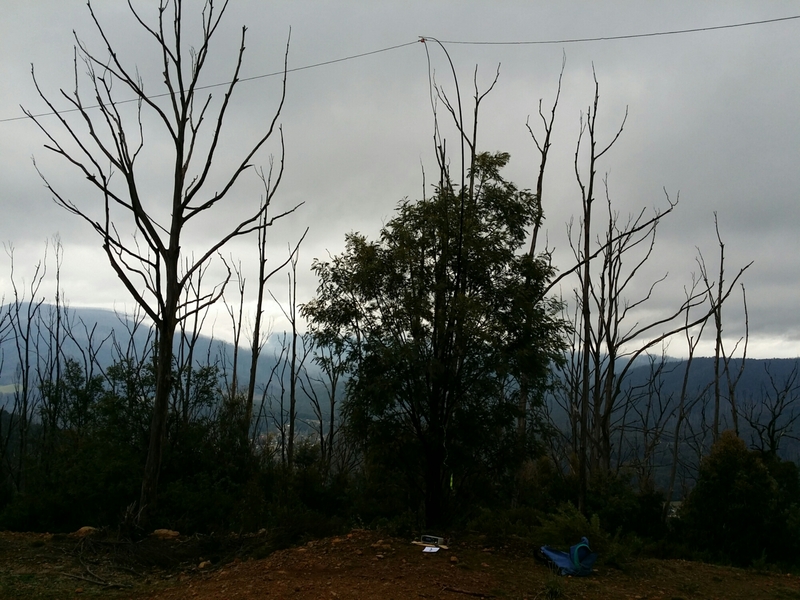 As Wayne VK3WAM notes the entire south east side of the mountain was logged a few years ago and is now covered in 3 to 4 meter high regrowth. Wayne took a great picture looking down over the south side. In the misty white-out, no such view was on offer to me. There is no way up other than on the old logging tracks. The track I took, veering of Dom Dom Rd to the left, itself is overgrown and very chopped up. 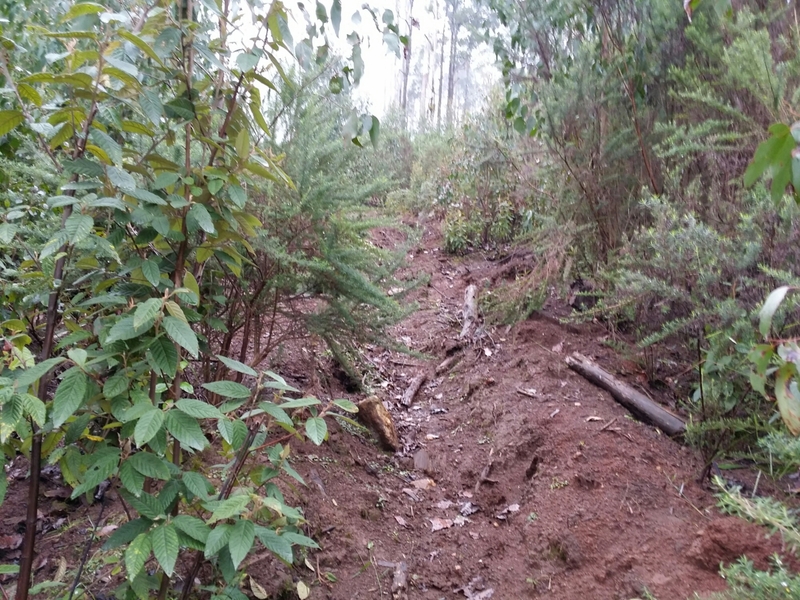 It has not had a 4wd on it for quite a while and in places bushes and saplings have established mid track. After about 15 minutes it levels off and leaves you on the south end of the summit. At the top, a large cover of mountain ash were left by the loggers, and these mighty trees stand as a forest of enormous flag poles catching the wind. The logged flanks of the summit are easy walking but the absolute top is thickly overthrown. 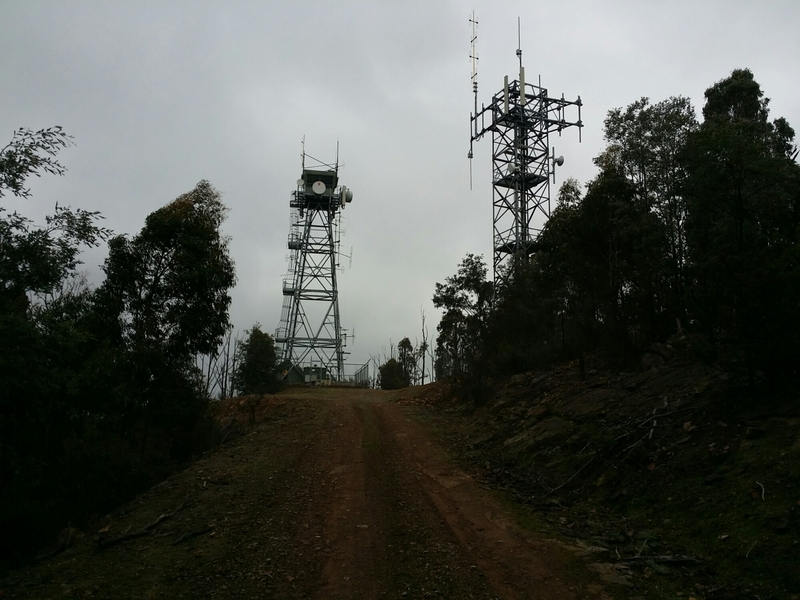 Not wishing to get wet and grubby by bush-bashing into it, I checked altitude in a clearing at the edge of the thick bush and at 714 of Dom Dom’s 728 meters decided I had found my activation point. The mountain top was shrouded in mist which made for a damp and eerie but beautiful setting. Using my phone’s front camera, I tried a selfie of me, the squid pole, and the mighty mountain ash on the Mt Dom Dom summit, shrouded in mist. After self-spotting, 18 QSOs followed with Rod VK2TWR on VK2/SM-083, Andrew VK1NAM on VK1/AC-033 and Alan VK3HRA on VK3/VW-015. Next on the list for the afternoon was Mt Gordon, by comparison with some of the other summits around this part of the VK3/VN region, an easy and most enjoyable activation. First, I drove into Marysville for a snack. As an aside may I note that I have never seen Marysville so busy, or difficult to find a car park in, with queuing four rows deep in the overflowing bakery. Having secured coffee and bun, I drove on the Marysville road back towards Melbourne about 3.4km. Almost opposite the a trout farm is Mt Gordon Rd. This is a good gravel road that takes you all the way to the top without issue. The summit is a welcome change from some of the less frequented mountains in the area. The road circles around the compact summit with two comms facilities including a large tower in the center. Plenty of room for parking, which I did, walking my kit back down the track almost to the gate to exit and re enter the activation zone. This summit has the quintessential SOTA prominence, falling away steeply on most sides. There are very pleading views north to what I assume was Buxton down in the valley below. It struck me as a very nice place for a picnic. Or a field day. Only problem was the almost total absence of anything to tie a squid pole to. I ended up using a wattle on the northern edge of the track which was a poor support and resulted in the squid pole bending over badly. No problems with getting out, however. 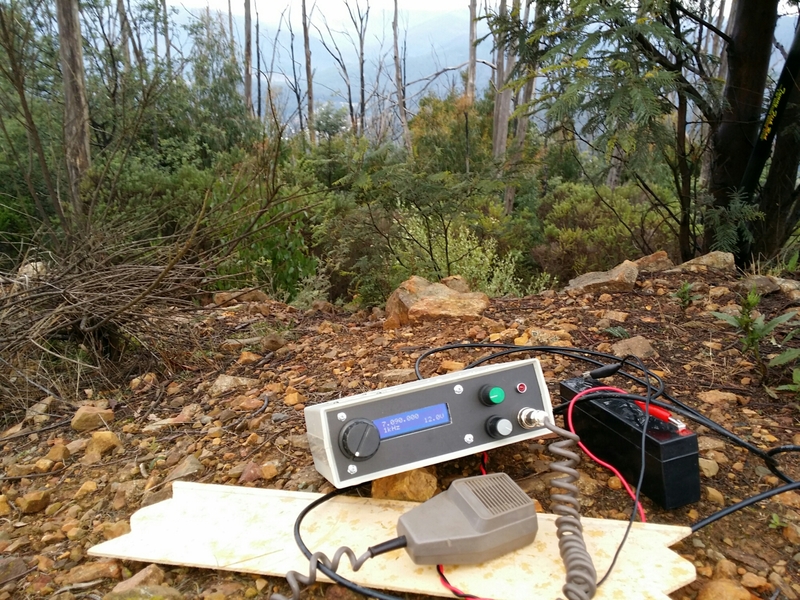 16 contacts, including VK2IB/3 on VK3/VE-135 (Lockhart, 1004m, 6 points, south of Tallangatta) and Alan VK3HRA/P on VK3/VW-017 (North Burranj Range, 454m, 1 point). I see Andrew was doing a first activation of North Burranj Range, just a bit west of south from Horsham. I attempted some photos of the rig on the ground with the views of Buxton in the valley as backdrop but seem to have missed the township! 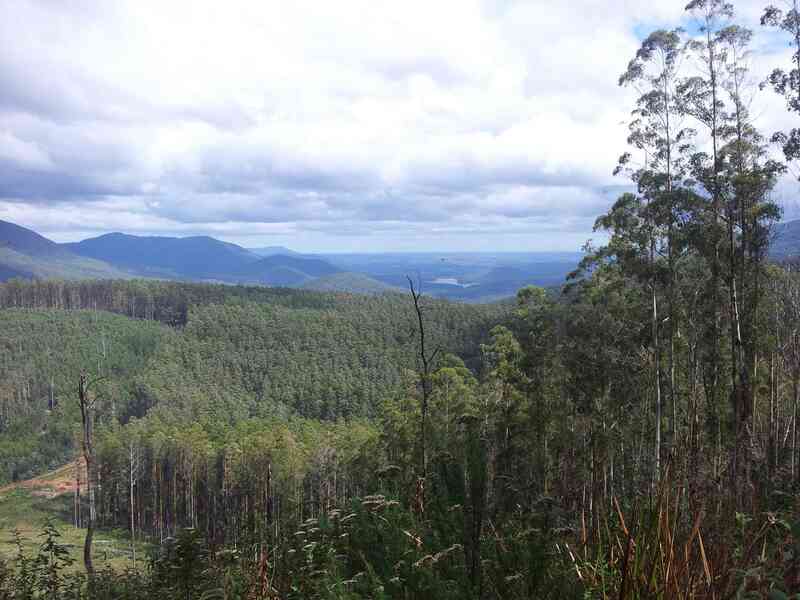 Most enjoyable, no walking or climbing, an excellent place for an easy activation before or after lunch at Marysville. Just prepare yourself for the crowds! Good reading Paul. You may not be aware, in April this year SOTA MT revised the general rules covering entry into the AZ. You are not required to walk-in & walk-out when accessing the summit AZ by a motor vehicle. 🙂 Extant rules regarding the separation of the station from a vehicle haven’t changed.